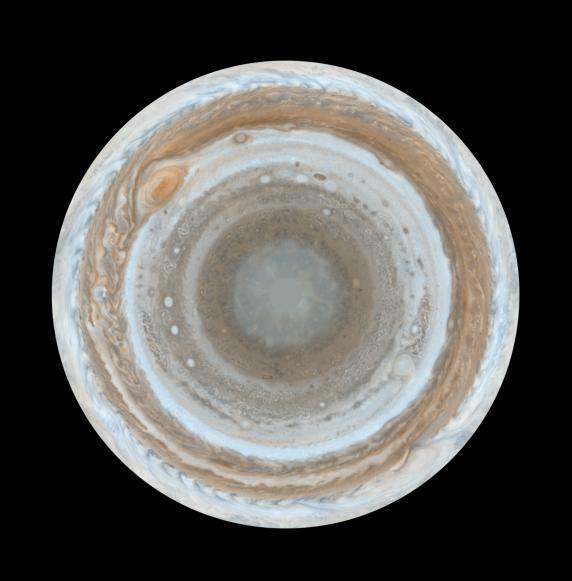 First of all a rather fine photo courtesy of Nasa/JPL/Space science institute of the South pole of Jupiter in all its marbled glory. I have a tenuous link to this photo in that my work experience at the age of 15 involved working on the Cassini-Huygens mission to Jupiter and Saturn which has taken so many spectacular photos as well as carrying out a host of other imaging and sensing measurements. In particular I was involved (as far as I remember I was reproducing things which had already been done, I make no actual claims to have helped) with the probe to Titan (one of Saturn's moons) which floated 'gently' down onto the surface of this strange moon to sample the atmosphere and work out what sort of surface was down there. It ended up landing on a coastline of a liquid ocean which may well be methane though it seems to have chunks of water ice floating around in it. The orbiter itself has taken a wealth of data on a huge range of astronomical phenomena from testing general relativity (successfully) to studying the spokes of Saturn's rings and also giving us these great photos of Jupiter. These sort of missions also go into my category of extremes that I spoke about previously. The accuracy of the trajectory is stunning with the position and timing being known to within a fraction of a second after many months of slingshots around planets at many km per second and the effects of all planets and moons being taken into account. Rocket science may not be string theory but it's still a pretty fine art. A little physics before I take a break for a couple of weeks (though work will have to come too!). Today we had a seminar from Ed Samulski from The University of North Carolina in Chapel Hill. It was one of the few seminars I get to watch where I understood every word. This is partly because it wasn't in Chinese and partly because Ed Samulski is an excellent speaker. What's more strange perhaps is that his research is in a completely different field to mine. In fact he's a chemist and his research is into liquid crystals, a 45 billion dollar industry, so one that gets a reasonable amount of government funding. His talk was about a new phase of liquid crystals which he and his coworkers had discovered a couple of years ago. The validity of this finding is still disputed and various papers attacking it will be coming out in the next few months. The idea of a liquid crystal is a relatively simple but ingenious one. Crystals have their molecules aligned in a nice lattice or grid such that the system is very highly ordered. The molecules are stuck in their positions and though they may vibrate around, they don't shift places. Generally when you heat up a crystal, at some point it will melt. When it melts, all this order is lost. The lattice breaks down and the molecules (which now have more energy as they've been heated) rush around in all directions bumping into each other. It turns out that for some types of molecule something happens in between these two points. Some molecules (such as chains of a few benzene rings) are long and thin and can be thought of like rods, or rolling pins. What happens in between the solid and liquid phase is that there is an intermediate state which has less order than the solid and more than the liquid. The molecules all move about freely as they do in the liquid but this time their orientation is the same, they are all lined up in the same direction, with the long axis of the rolling pin all pointing one way. What's so useful about this is that when they are in this state, by applying an electric field to the new phase (called the nematic phase, or liquid crystal phase) you can change which direction these molecules like to point. What's more, when the molecules are pointing in one direction only light of a particular polarisation (read: a wave oscillating in a fixed direction) can easily pass though the material. By altering the current and using extra polarisers you have a system where you can change the amount of light that passes through it, just by altering the electric field. That's exactly how LCD displays work. They have this liquid crystal in a grid on the screen, a set of polarisers sandwiching the liquid and a series of electric plates to turn the light on or off for a particular colour of grid. Simple as that. So...nothing new here. What Prof Samulski discovered was that if you bend these rods (using clever chemistry tricks) you find that there's another form of ordering that can take place related to the plane in which you bend the molecules. What this all boils down to is that he found a new phase in between the nematic phase and the liquid phase called the biaxial nematic phase which may be applicable for making much faster and higher resolution LCDs. Along with all this he managed to show that mean field theory which is often used to model liquid crystals matches pretty poorly, even in the most ideal of cases. Anyway, I wanted to talk about that as it's unusual to go to such a clearly explained lecture. I apologies that my explanation will be trivial for those who know it and a muddle for those who don't but if you want to know more, I suggest you follow some of the links.